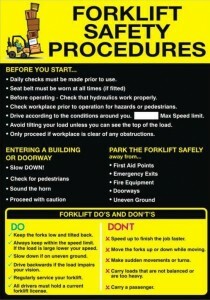 Forklift operator training programs can often lead people to believe that they are effective. This along with a suitable forklift safety procedure should maximise work output whilst ensuring your workforce is protected. However it is only when things start to go wrong that shortcomings in the training program are revealed. Recent industry observations have concluded that it does not have to be a challenging task to identify and quantify how prepared an operator is and their levels of productivity. Wayne Wilde, the field technical sales officer for UniCarriers identified that the first step should be to establish a policy and a suitable forklift safety procedure for both the use of equipment and also for the carrying of materials and loads. To demonstrate, what are the current policies for the handling of liquid loads compared with those for handling solid loads? Or what is your existing policy for using your electrical trucks outdoors? Wilde stated “If a manager says someone is breaking the rules, he ought to be able to point to the rule in question. Often I ask about policies for materials handling and forklift operation and I get a ‘deer in the headlights’ look.” However developing new policies needn’t be a complete upheaval of previous practices. The Industrial Truck Standards Development Foundation (ITSDF) standard B56, is a free document which can be downloaded. The document contains a user section which outlines a number of correct operating practices. This document can be implemented into your training program as an additional supplement. Wilde claims that the main way to notice and pick up on short comings to your existing training program is by creating a culture of accountability. Under this culture of accountability it is not only incidents which should be recorded, near-misses should also be reported and recorded by both operators and pedestrians nearby. Unfortunately, bad habits can quickly emerge around aspects of operation as simple as replacing batteries. If an operator runs a battery to empty during a shift there is no doubt that replacing it will greatly interrupt the productivity of that shift. Once an organisation has put policies and a standard agenda in place, it should then look at evaluating and reviewing these measures on a regular basis. Wilde suggests that after a year of using one procedure that you should embark on a thorough analysis of it in order to ensure that it is working as it should be. Wilde additionally recommends that customers make use of up-to-date resources from manufacturers and also provide both managers and employees with an input into the training and also the development of your policies. This entry was posted in Health & Safety and tagged forklift safety procedure on October 29, 2013 by admin. Forklift Truck License: How Do You Apply For One? Electric Pallet Trucks – Great To Reduce Your Workforce’s Exertion!